LUX Meter project has been design to measure the illumination. Illumination is luminous flux falling on surface area of photo diode. This illumination converted to corresponding voltage using Op-Amp circuit. 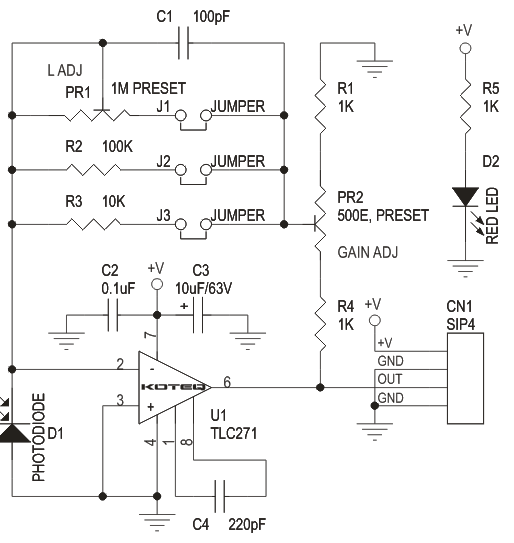 The project is designed around Texas instrument Op-Amp TLC271 which can operate from single supply with low bias current, here op-amp act as current to voltage converter. 5000 LUX (approx) can be measure with a voltmeter having 5V range. Meter is not provided.